This article was corrected shortly after publishing. See ‘corrections’ for details. Transport police have roped in the military to join underground patrols to keep bustling commuters safe. 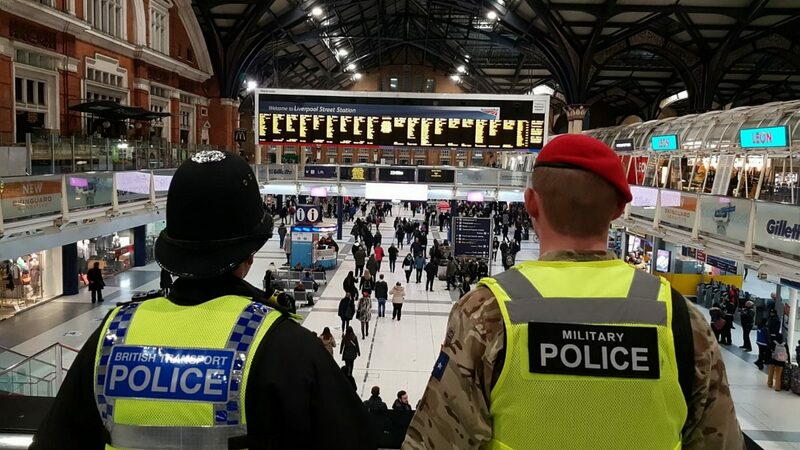 The “unique agreement” between British Transport Police (BTP) and Royal Military Police (RMP) will mean the red hats and brown uniforms could become the norm at the capital’s busiest stations. The skill-sharing exercise will bring in military officers from Hampshire and Essex to bulk up patrols on the Underground. After a pilot at Waterloo Station, the scheme has been rolled out along the Waterloo & City line to Liverpool Street – and there are plans to expand it even further. The number of police officers in England and Wales has fallen from up to 22,000 from 2010 to 2018. BTP Superintendent Matt Allingham said: “This is a great, practical way to bring two specialist police organisations together to share expertise and enhance what we do. “By giving Royal Military Police personnel the opportunity to shadow our teams at two of London’s busiest stations they’ll be able to gain first-hand experience of wider policing. “There are clear benefits brought by the increasing uniformed visibility at our key transport hubs in relation to crime prevention. “The uniqueness of having joint military and police personnel on patrol also provides a conversation starter with the travelling public and assists with engagement in line with NPT principles. RMP officers from Hampshire, Essex and Suffolk will be patrolling with their London colleagues from the UK’s busiest train station to Liverpool Street. Major Michael Boyd, Officer Commanding 156 Provost Company, 4 Regiment Royal Military Police added: “On behalf of my colleagues from Aldershot and I, we are hugely grateful to BTP for this partnership opportunity. “Essex, Suffolk, Hampshire and beyond are areas with significant military bases, with numerous Forces personnel and their families using the rail network every day. The original headline read “Stretched transport police have roped in the military to join underground patrols to keep bustling commuters safe from terror threats”. This has been corrected as the partnership was not formed because of stretched resources or in related to terror threats, but to strengthen both organisations specialisms and to better share expertise. Previous PostBREAKING: Trump back in UK in December. Will he face protests like last time?